In a global society where cameras are prevalent the world over, human rights atrocities are increasingly difficult for the perpetrators to keep under wraps. What we're seeing now in Russia isn't new; it's just more public than ever before. Ideological borders are permeable, so while draconian hate laws can be passed and enforced within the borders of a country, the global community will not ignore them. 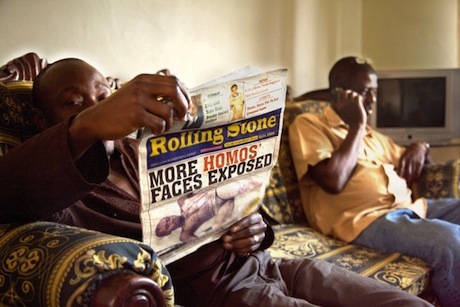 Taking a hard look at the prevailing attitudes in Uganda, Call Me Kuchu specifically focuses on the efforts of that country's first openly gay man—with the help of the activist community he's inspired—to fight a bill that would make homosexuality punishable by death. David Kato is presented as a tireless advocate for tolerance and LGBT rights. He's warm, charming, funny and undeniably courageous, but also very pragmatic when it comes to safety. In one of many anecdotes he shares with the filmmakers, the levelheaded activist explains why he doesn't go to court without a representative of the Human Rights Commission present anymore: nothing is more protective than a foreign eye. This is the other side of the Big Brother argument: who wants to cast the first stone when the world is watching? Instead of admitting to the acts of violence that follow when the cameras are turned off, zealous bigots hiding behind scripture given to them by the same colonialist missionaries that stapled their tongues for speaking their native language opt to vehemently deny that any persecution is taking place. To ensure balance (and give opponents of homosexuality enough rope to hang themselves), the directors interview people from all walks of life, allowing them to speak their piece, however horrifying and frustrating the opinion. This includes the smug giggling of a local tabloid editor known for outing people, complete with pictures and home addresses, in his magazine. He's very proud of his time spent infiltrating the almost entirely underground gay community and while discussing circulation numbers notes "Ugandans seem to love looking at pictures of gay people." The irony and hypocrisy is not lost on him but, like many, he's so convinced of the moral superiority of his position that rationality plays no part in his thought process. If Call Me Kuchu simply maintained this hands-off approach to presenting the varied attitudes of Ugandan citizens and those of the missionaries from both sides of the issue, it would be an effective, first-rate documentary. But history happens while the cameras are rolling, giving the entire project the kind of gravity that can't be manufactured.